measurement and display on BPON/EPON/GPON. (3) Used in Burst mode measurement of 1310nm upstream. 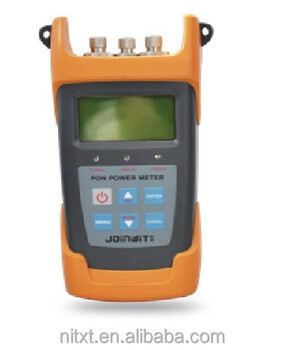 can be saved in T-PO3213 PON power meter or computer for data review. (9) Offers up to 10 different threshold sets in total,Three status LEDs represent different optical signal conditions of Pass, Warn and Fail respectively. (11) Good key design,high sensitivity, greatly reducing the volume and weight of the tester. (12) Different models corresponding to different function, according to own use to choose . > We guarantee all our electrical and mechanical parts for one year from the delivery date the machine running smooth in customer's place. > We guarantee that each product is tested carefully and works very well before shipment. We strive for 100% customer satisfaction on every sale we complete. > We are responsible for the whole lifespan of our products, and whenever you have questions during use, just call us, we are glad to offer technical support timely. > During the warranty period, we can repair or replace the defective parts for free. > After the warranty time, we also repair the defective parts, but only charge part cost. > When you receive the package, please open and check it before signing, if it's damaged, ask a "Damage proof" from the delivery company. Nanjing Tianxingtong Electronic Technology Co., Ltd. is a China leading manufacturer of Optical Fiber Fusion Splicer related products, with ultra-reliable quality, timely delivery & thoughtful service. 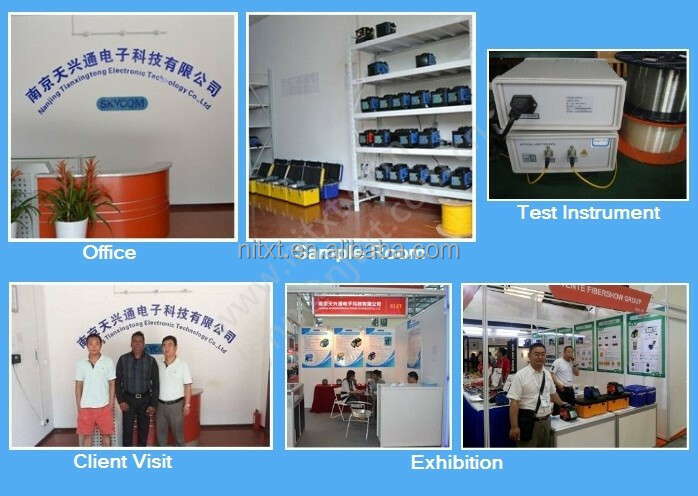 The main products series include fusion splicer, OTDR, optical fiber cleaver, skinline cable welding machine, power meter, etc. We invite you to visit our booth, to see and check our fusion splicers with your own eyes and hands. Let us talk face to face! We look forward to establishing business relationships and mutual success. > Skycom fusion splicers and OTDR are widely applied to support the use of all kinds of optical communication engineering at home and abroad. Our Sales network reaches Southeast Asia, Africa and West Europe. Such as: Peru, Pakistan, Malaysia and so on. > Skycom has won a good reputation for its ultra-reliable quality and thoughtful service for over 4 years. > Professional: Specialized in manufacturing and selling optical fiber devices for more than 4 years. We are gold supplier with 4 years history, up to now, our products have been covering more than 20 countries of all over the world. OEM/ ODM, Customized service. Offer service of adding customer's logo. 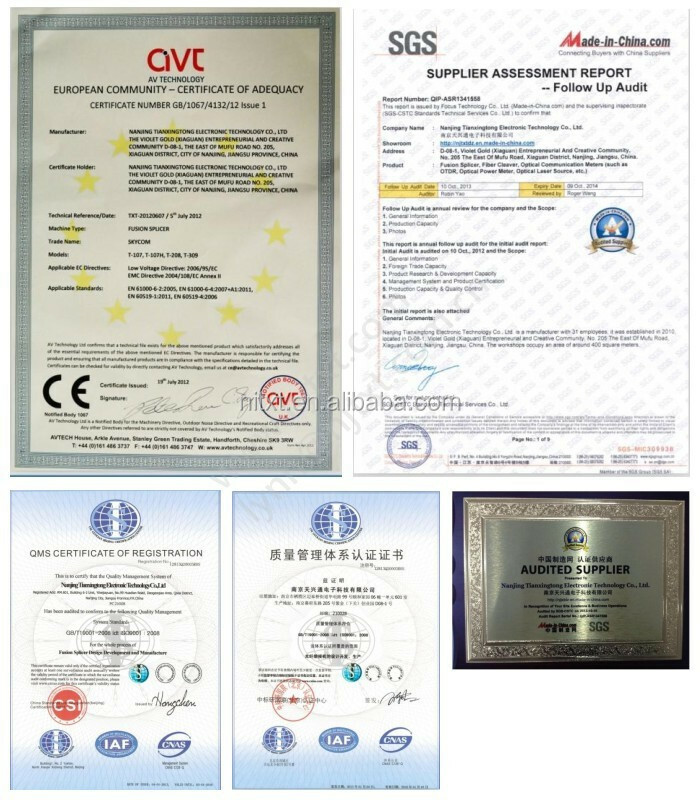 > Excellent Quality: All our products have pasted the tests by SGS, CE & CSI. > Timely Delivery: All our goods can be delivered within 3 working days. > Reasonable Price: We provide pretty cost-effective products. Factory Direct price must be competitive. > Trustful: We treat our workers and clients as respectful partners. Special discount and protection of sales area provided to your distributor. > Thoughtful Aftersales Service: Long warranty time, free and timely technical support andspecial training make you using our products without any worries. 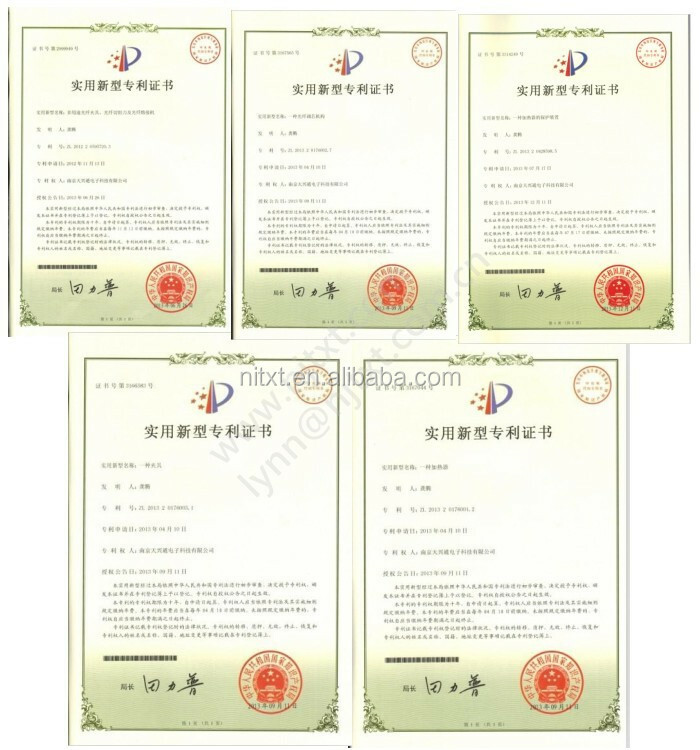 > Are you the manufacturer or trading company? The quality of our fusion splicer is superior with good stability. We are professional manufacturer and R&D fusion splicer by ourselves. We created world first 3 in 1 multi-purpose fixture which makes our machine applicable for bare fiber, Rubber-insulated cable and fiber optic patch cord, each machine is high end materials and strict 3-time Quality Tests. > How about use fusion splicers on cables? Yes, it is appliable to cables. > How can we go to your factory? 1. By Train: Take the Beijing-Shanghai high-speed railway to Nanjing South Station, from Nanjing South station to our factory just 40 minutes by taxi. 2. By Air: Nanjing airport to our factory 1.5 hours by taxi. (Please kindly inform us in advance, so we could pick you up at the airport). Sincerely welcome you to visit our company! > We are looking for distributors of Skycom fusion splicer in North America, South Asia, Africa and North Europe. > If you are interested in our patented fusion splicers, please feel free to contact us. > Website: www. njtxt. com/ ADD: 5F, Zijin Office, No. 58, Hengjing Road, Nanjing City, China.